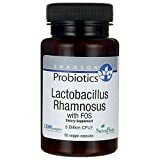 Lactobacillus rhamnosus health benefits may include supporting weight loss, improve digestive health and helping to improve immune system function. This probiotic supplement is also being researched for its effects on lowering cholesterol, treating atopic dermatitis, preventing E. Coli infections and improving allergic conditions. Clinical studies have also shown this strain of probiotic has liver repairing properties. Lactobacillus rhamnosus probiotic supplements are also used to treat antibiotic-associated diarrhea. Studies have also shown L. rhamnosus reduces anxiety and depression associated behaviors. Like all probiotic bacteria, L. rhamnosus works by inhibiting the growth of harmful bacteria in the gastrointestinal tract. This supplement helps to break down foods that we eat and is important for maintaining a low pH acidic environment in the gut. The benefits of Lactobacillus rhamnosus also include protection against rotaviral diarrhea, improved skin health, relief from IBS, and prevention of Bacterial Vaginosis (BV) and other infections in the female urogenital tract. Lactobacillus Rhamnosus is a probiotic strain of Lactic Acid Bacteria (LAB) found naturally in the female urinary tract. Supplementing with this “friendly” bacterial organism can help to restore balance in the human microbiota. L. Rhamnosus is found naturally in some milk and yogurt products. However, it derive the benefits of this probiotic, it is often necessary to consume capsules or tablets that contain a higher dosage of L. Rhamnosus, measured in the number of Colony Forming Units (CFUs) provided. Most high-quality probiotic supplements will contain between 1 – 10 billion live CFUs per serving. You can speak to your doctor to determine the best dosage for you to derive desired health benefits. Lactobacillus rhamnosus GG (ATCC 53103) is a proprietary strain of probiotic bacteria that was isolated by Dr. Sherwood Gorbach and Dr. Barry Goldin from Boston, MA. It is called Lactobacillus rhamnosus GG after their last name initials. LGG® is a registered trademark of the company Valio Ltd. located in Finland. This probiotic strain is stomach acid and bile stable so it reaches the gut in a viable condition. Most studies that have examined the effects of Lactobacillus rhamnosus have used this proprietary strain of bacteria. Lactobacillus rhamnosus GG has been researched for a number of health benefits. This probiotic decreases the development of eczema in children as it modulates the immune systems response to allergy conditions. This probiotic strain has anti-inflammatory properties and reduces the C-reactive protein (CRP) found in blood plasma which is an inflammation marker in healthy adults. This protein is produced in reaction to bacterial, viral, or fungal infections as well as rheumatic and other inflammatory diseases. These types of conditions cause the release of interleukin-6 (IL-6) and other cytokines (proteins) that trigger the synthesis of CRP and fibrinogen by the liver. CRP works as an early defense system against infections. Recent research suggests that patients with elevated basal levels of CRP have an increased risk of developing diabetes, hypertension and cardiovascular disease. A clinical study published in Probiotics and Antimicrobial Proteins in December 2011 showed Lactobacillus rhamnosus BFE 5264 and Lactobacillus plantarum NR74 promote cholesterol excretion. From the data results of this clinical study, it was concluded that L. rhamnosus BFE5264 and L. plantarum NR74 promoted cholesterol efflux in the enterocytes (intestinal absorptive columnar epithelial cells found in the small intestine). This beneficial action was seen as a potential treatment to prevent hypercholesterolemia (high levels of cholesterol in the blood). Long term elevations of serum cholesterol can lead to atherosclerosis (also known as arteriosclerotic vascular disease or ASVD). In ASVD the artery wall thickens due to the invasion and accumulation of white blood cells (WBCs) and an increase in the intimal smooth muscle cell that creates a fibrofatty plaque. Tobacco use and eating processed foods increases the risk of developing this condition. Data from 2004 in the USA showed that in 66% of men and 47% of women, the first symptom of atherosclerotic cardiovascular disease is a heart attack or sudden cardiac death. Lactobacillus rhamnosus benefits also include a reduction in symptoms of atopic dermatitis. A clinical study published in the Journal of Microbiology, Immunology and Infection in November 2015 showed children age 4 to 48 months who took L. rhamnosus for 8 weeks expressed less SCORAD (SCORing Atopic Dermatitis) in three components. These components were the area of affected skin, the intensity of atopic dermatitis, and patient symptoms. There was a significant decrease in the intensity of symptoms in the probiotic group from baseline compared with the placebo group. A clinical study published in Applied and Environmental Microbiology showed Lactobacillus rhamnosus GR-1 lessens Escherichia coli induced inflammation and cell damage on bovine mammary epithelial cells (BMEC’s). The increases in the TLR4, (receptor for activating the immune system) NOD1, and NOD2 (protein receptors that recognizes bacterial molecules and stimulates an immune reaction) mRNA expression was observed during the E. coli challenge, but this increase was stopped by the L. rhamnosus GR-1 pretreatment. L. Rhamnosus is well tolerated when used in probiotic supplements. There is a low reported incidence of side effects. Some individuals do report digestive discomfort, bloading, diarrhea or gas when first using probiotics. Probiotics should not be taken by immune-impaired individuals, those using a catheter, or those with open surgical wounds. Those with SBS (Short Bowel Syndrome) should also avoid probiotics that contain Lactobacillus Rhamnosus. If you take probiotic supplements at the same time as antibiotics, there is a possibility that the efficacy of both of these products will be diminished. It is recommended to leave at least two hours between using probiotics and antibiotics. Lactobacillus rhamnosus benefits include being a treatment for diarrhea, constipation, against infection and to alleviate allergy symptoms and improve mood. Speak to your doctor to find out if this supplement is appropriate for you. Yoon HS, Lactobacillus rhamnosus BFE 5264 and Lactobacillus plantarum NR74 Promote Cholesterol Excretion Through the Up-Regulation of ABCG5/8 in Caco-2 Cells. Probiotics Antimicrob Proteins 2011 Dec;3(3-4):194-203. doi: 10.1007/s12602-011-9086-3. Chen RC, Lactobacillus rhamnosus GG supernatant promotes intestinal barrier function, balances Treg and TH17 cells and ameliorates hepatic injury in a mouse model of chronic-binge alcohol feeding. Toxicol Lett 2016 Jan 22;241:103-10. doi: 10.1016/j.toxlet.2015.11.019. Epub 2015 Nov 23. Janik R, Magnetic resonance spectroscopy reveals oral Lactobacillus promotion of increases in brain GABA, N-acetyl aspartate and glutamate Neuroimage 2016 Jan 15;125:988-95. doi: 10.1016/j.neuroimage.2015.11.018. Epub 2015 Nov 11.